I’ve started to get a system for producing the watercolor paintings for the children’s book, “For I Am Yours” by author Pauline Hawkins. I have all the drawings for the 17 illustrations ready. As I start to finish up a painting that I am working on, I will use my light table and transfer a few more drawings to my watercolor paper. I work on Arches, 140 lb. cold press, watercolor paper. 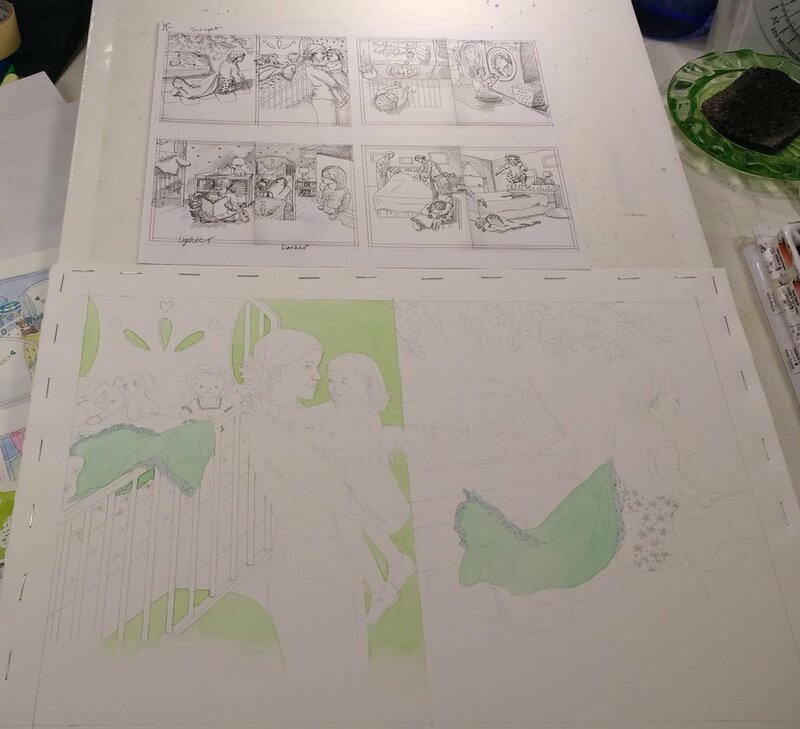 After I have transferred the drawing to the watercolor paper, I stretch my paper onto gator foam boards. You can see my Youtube video about the process at this link: How to Stretch Watercolor Paper and Transfer a Drawing. In the image above, I have transferred the drawing, stretched my paper, and begun the painting. I also scanned my drawings and made small copies of them to create a value sketch (seen at the top of this image). These value sketches will help remind me where my light is coming from for the watercolor illustrations. I am working with minimal photo resources and making up most of the scene. So, I have to chose the direction of my light source and taking the time to create the value studies is important to help get the light and the composition right. 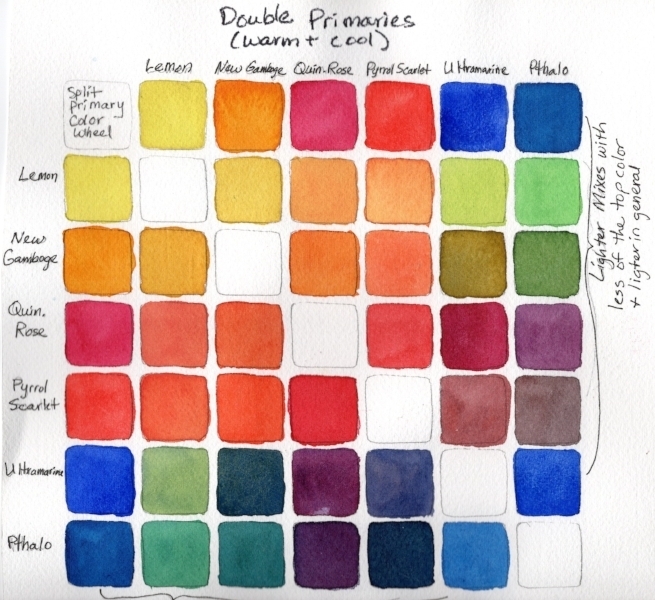 I started these two pages by painting the first layers of color on sections of the painting. At this stage, I am working with the lightest value of the color in each of the shapes. In a few areas of the illustration at the right, I have started to add some shading. I use water on the edges of these shadows to soften them into the lighter area because the light on the subject is indirect light from a window or room light. The second image shows the baby taking the blanket outside with her. I started this painting by wetting the grass background and then applying color. I wanted there to be a variety of greens in the grass. After the grass dried, I added the leaves of the tree branches by spritzing some water in that area and then painting random leaf shapes over and around the water drops. Some areas will have soft edges due to the water. Then I added the first layers on the sandbox, blanket, her skin and pants. Now that I have a basic idea of how the colors and composition are working, I can begin to add more layers. The next steps show this process. After I have the beginning stages on both of the illustrations, I usually get interested in one of them and start working on it solely. In this case, The baby pulling the blanket outside, caught my attention. I knew what colors I wanted to use in this illustration. I used a paint called Tiger’s Eye Genuine for the sandbox because it is very granular and would automatically give me the look of sand. I mixed it with some ultramarine blue in a few places for the shadows. I believe the leaves on the tree were done with mixes of Sap Green and Ultramarine blue, some Green Apatite Genuine, or some Serpentine Green. I added the shadows last over the top of the other colors. 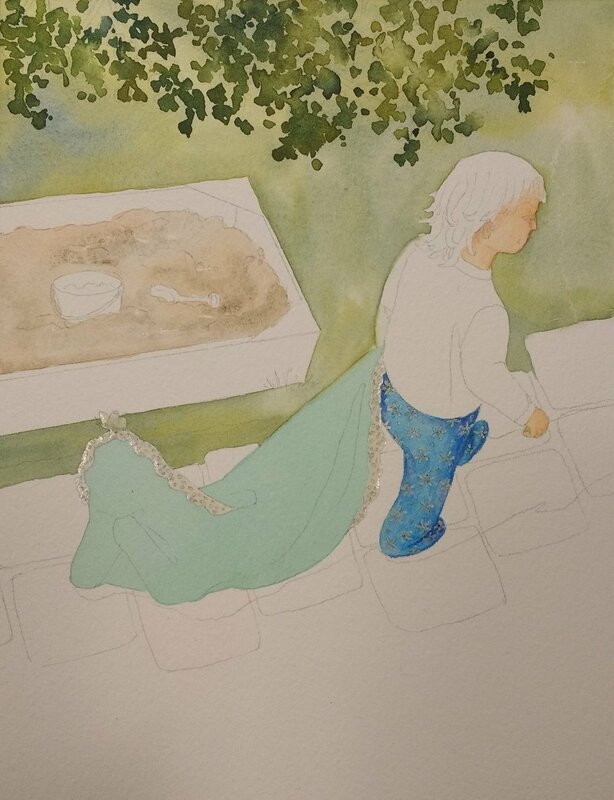 Whenever I create shadows in watercolor, I lay them over the base color, like the grass, the stepping stones, or the blanket. I want the base color to effect the look of the shadow. I also don’t want my shadows too dark or they can look like black holes. In this case I used Ultramarine Blue and Pyrrol Scarlet (a warm red) to create a neutral or muted purple shadow color. 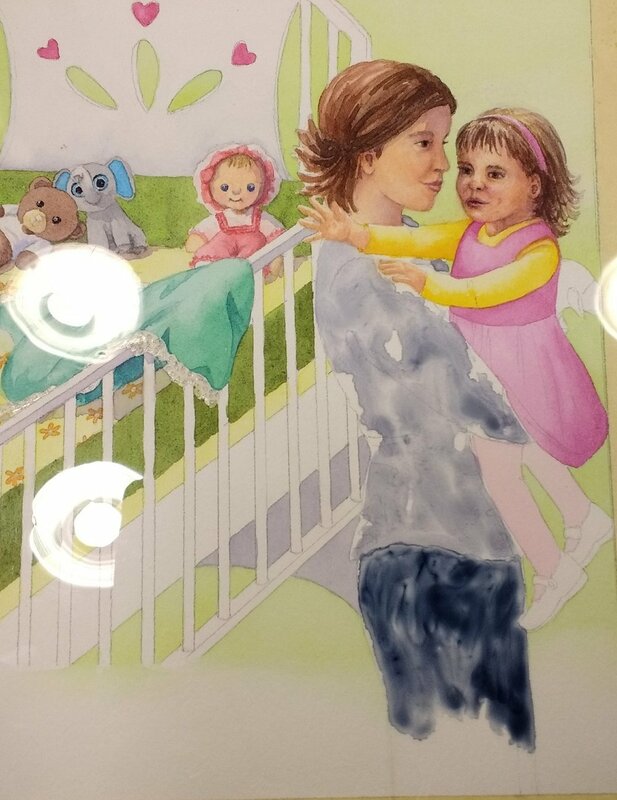 When I went back to the first painting, where the baby is reaching out for the blanket, I had a hard time deciding what color I wanted mom’s clothes to be. I could have done a small color study beforehand or in this case I used some clear acetate that works with wet media like watercolor to get an idea of my colors. In the image at the right, I have laid the acetate over the painting and then painted with my watercolor right on top of the acetate to get an idea of the color I might use. (Sorry about the bright highlights. Those are my desk lights reflecting in the acetate.) 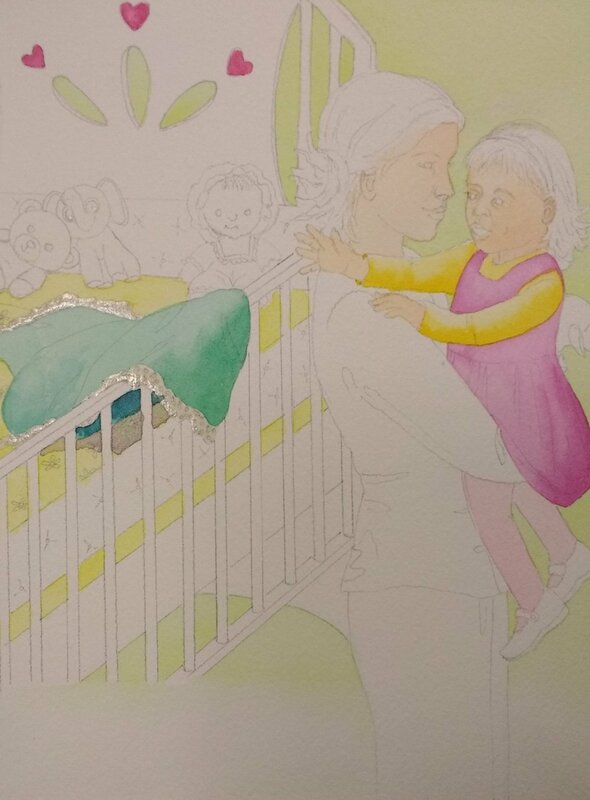 I chose to go with the gray tones in mom’s outfit because there were a lot of bright colors in the rest of the scene. I felt there needed to be some neutral colors to counter balance the bright colors. I kept adding layers to both illustrations. When I didn’t know where to go with one or I was waiting for the paint to dry, I would work on the other one. I added more glazes to both to deepen the colors. I used the same color or a mix to add depth. I also added some more shadows to the outside scene and used a little Indigo on the inside scene to shadow the corners. Shading the corners helps keep the viewers eye focused on the center of the illustration. These were now complete enough to move onto the next illustrations. I will often leave the recently completed paintings on my board for a few days to make sure I don’t see anything else that needs adjusting. I will be continuing to blog about this process if you would like to follow along.